Dressage4Kids is celebrating its 20th anniversary and we would like to invite you to join us in celebration! Over the past twenty years, Dressage4Kids has touched the lives of thousands of dressage enthusiasts who have developed into our present international competitors, professionals, and lovers of horses. The party will take place on Saturday, October 13th, coinciding with the 2018 NEDA Fall Symposium featuring Olympic Gold Medalist and World Record holder Charlotte Dujardin. The Dressage4Kids celebration will be held at The Boylston Rooms in Easthampton, Massachusetts and will commence following the conclusion of Saturday’s activities. Attire is casual – guests are welcome to come directly from the Symposium. The Dressage4Kids celebration will include food and festivities by Myer’s Catering and DJ Rob Alberti. For tickets, to make a donation, and for more info, go to: https://dressage4kidsorg.presencehost.net/news-events/20th-anniversary-celebration.html. Lyman, Maine – May 22, 2017 – Carlisle Academy Integrative Equine Therapy & Sports, recognized as a USEF/USPEA National Para-Equestrian Dressage Center of Excellence, will host a Para Dressage/Dressage Symposium and Evaluation Ride Schooling Show June 2-4, with Hanneke Gerritsen. Hanneke Gerritsen is a FEI 5* Paralympic Dressage Judge and Deputy Chair of the FEI Technical Committee. Gerritsen will offer an educational and interactive symposium packed with information and training for riders and coaches. The symposium will be held at the Carlisle Academy located in Lyman, Maine. Friday & Saturday, June 2-3, 2017, includes the Dressage & Para-Dressage Symposium, followed by Sunday, June 4, Dressage & Para-Dressage Schooling Show. Para-dressage athletes, dressage riders, and interested veterans are encouraged to attend. For more information about dates, activities, or biographies, please visit http://carlisleacademymaine.com/programs/sports-education/para-dressage-education-training/ or contact Sarah Armentrout, Head of School, at sarmentrout@carlisleacademymaine.com or 207-985-0374. Para Dressage Judge Kristi Wysocki talks about shoulder in. Wellington, FL – January 28, 2017 – Following a successful Adequan® Global Dressage Festival CPEDI3* in Wellington, Florida, FEI 3* Dressage and FEI 4* Para Dressage Judge Kristi Wysocki conducted an international Para-Dressage Symposium in Collaboration with U.S. Technical Advisor Kai Handt. The symposium ran over three days January 22-24, 2017, and it included demonstration rides of the new tests given by top level Dressage riders. The focus of the symposium was to talk about and work on technical aspects of the FEI tests that were recently released. Kristi Wysocki was able to give her recent experience judging the new tests at the Adequan® Global Dressage Festival CPEDI3* and explain to the riders what they should aim for in each Para-Dressage Grade. Kai Handt worked with the riders and spoke to them about horse preparation and expectations in the ring. The format of the symposium included both riding intensive and sit down discussions. The Adequan® Global Dressage Festival CPEDI3* in Wellington, Florida is scheduled for March 9-12, 2017 at The Stadium at the Palm Beach International Equestrian Center. Kai Handt at the 2014 Alltech FEI World Equestrian Games with Roxanne Trunnell (USA). Wellington, FL – January 4, 2016 – Para-Equestrian Dressage riders from the United States are encouraged to participate in the USEF Para-Equestrian Dressage High Performance Symposium Develop the Coach Program held in Wellington, FL. The Symposium will include FEI International 4* Dressage Judge Carlos Lopes of Portugal and U.S. Chef d’Equipe Kai Handt. The symposium is scheduled for January 10-12, 2016, following the Adequan® Global Dressage Festival CPEDI3* January 7-10, 2016. The symposium will be held in the Van Kampen Arena at the Global Dressage Festival Show Grounds. Auditors are welcome. The two and a half day Symposium begins at 2 PM on Sunday, January 10, with a welcome from Kai Handt. Carlos Lopes will proceed with a lecture session on Para-Dressage theory, scales of training, quality of test movements, and much more. Monday, January 11, 2016, begins the practical sessions where each participant will ride for 45 minutes in a collaborative coaching model. This model includes each athlete’s coach in the session. Equestrians will enjoy learning alongside their own coach while preparing for international level Para-Dressage competition. The final day of the clinic includes an informative lecture, a practical session on freestyles and individual riding sessions. For more information on the details of this symposium, please contact Laureen Johnson, High Performance Director, Para Equestrian & Vaulting, United States Equestrian Federation, Inc. Phone: (908) 326-1155 Email: lkjohnson@usef.org or via cell after January 6 at (908) 229-1858. Carlos Manuel Lucas Lopes was born in Lisbon, on November 10th 1968, is married and father of two. He has been a rider since the age of ten and breeder of “Puro Sangue Lusitano” since 1998. Was one of the Escola Portuguesa de Arte Equestre (Portuguese Riding School) riders. National Team manager and head of Dressage teams (Grand Prix, junior and young riders) since 2005. He has, in this period, participated in 4 European Championships, 3 World Championships, 2 Olympic Games, and 1 World Cup. He is a member of the Portuguese Equestrian Federation Technical Committee since 2005. Has had several invitations to speak and take part in expert commissions and also in public forums organizes to promote the different equestrian disciplines and all kinds of subjects related to organizing equestrian shows and Lusitano breed. Carlos has tutored, on invitation, equestrian skills perfecting practical courses, worldwide, especially in Germany, EUA and Brazil. Certificated as Riding Teacher, FEI International Dressage 4* Judge, and FEI International Para Equestrian 5* Judge. Also certified as Trainer/Coach Dressage and Para dressage athletes. Has managed 5 equestrian centers, of which the Academia de Dressage Daniel Pinto is the most remarkable, for being one of the best equestrian centers in the world. Presently, and for the last 18 years, he manages the Centro Equestre da Quinta do Senhor da Serra, with a team of 4 monitors, teaching over 200 lessons a week. He has trained athletes of several age categories and has achieved remarkable results both in European, as well as in and World Championships. Never won an international event, but that is one of major aspirations. He has established a solid career as Judge, for which he has been granted effective recognition by all of the most important international institutions, resulting in invitations to judge in the most important Dressage and Para Equestrian events all over the world. Organized several Dressage, Para Dressage and Show Jumping events. Amongst such events, the 1st European Para Equestrian Championship, in 2001, and the European Dressage Championship for junior e and young riders, in 2008, 7 Iberian dressage cups finals (CDIs3*), CDI5* Al Shaqab, Doha, in 2013, Dressage discipline manager for the Madrid Horse Week, in 2014, selected in partnership with Dr. António Chaves de Almeida, among other companies in the world for the computerization of Dressage competitions at Sea Games, Thailand, are the most remarkable. He has also been responsible for the organization of over two dozens of National Championships and Portuguese Cup Finals. Lusitano breeder since 1998, has been dedicated to the development and improvement of this race towards sporting excellence in order to get horses with the potential to participate and compete for prizes in the highest international competitions. This is a work of care and time, but you have already obtained the best results above expectations. Consulting and breeding manager for several breeding facilities, Coudelaria Alegria dos Pinhais (Brazil), Haras Ilha Verde (Brazil) and Coudelaria Ortigão Costa (Portugal) are the most remarkable. * Individual coach and sponsor at 2012 Paralympics to the highest placing U.S. equestrian overall at the Paralympics and Olympics, as well as individual coach and sponsor at the 2010 World Equestrian Games in Lexington, KY.
* Individual coach for one or more riders at the 2009, 2010, 2011, 2012, and 2014 USEF National Para-Equestrian Dressage Championships earning 2011 USEF National Para-Equestrian Dressage Champion, 2012 USEF National Para-Equestrian Dressage Reserve Champion. * Individual coach at numerous CPEDI3* from 2009-2014 for multiple riders earning multiple grade championships, overall championships, and as part of the U.S. Team, several Team Championships. * Chef d’Equipe at 2012 CEPDI3* in Wellington for the Japanese Team, coaching their rider to their first Paralympic Equestrian qualifying score. * Chef d’Equipe at 2011 CPEDI3* in Mexico City, resulting in a U.S. Team Nation’s Cup win, overall individual reserve champion, and individual Grade 1a and Grade Ib champions. * Individual coach for Derrick Perkins; the first Para-Dressage rider from the United States Veteran’s Assistance Program in 2013. * Also in 2013, Handt was the individual coach for Para-Dressage riders Benjamin Harper, Roxanne Trunnell, and Derrick Perkins; as well as selector of appropriate horses for each individual at each show. All individuals achieved top scores ranging from 63.478%-73.478% during that show season. Kai Handt and Wes Dunham showcase collaborative coaching at the Northeast Symposium in 2013. Rider Sydney Collier aboard her own Wentworth works on gaits. Photo (C) Lindsay Y. McCall. Wellington, FL – January 7, 2015 – The United States Equestrian Federation, Inc. (USEF) is excited to announce a two-day Para Equestrian Dressage Symposium to be held at Global Dressage, Wellington, Florida, January 12 & 13, 2015, 8 AM-4 PM. Select U.S. High Performance and developing Para- Equestrian Dressage riders and coaches will be attending the symposium. Auditors are welcome to attend for $75. Pre-registering as an auditor is not required. Please contact Laureen Johnson at USEF at lkjohnson@usef.org if you are interested in auditing. Over two days U.S. High Performance and developing Para-Dressage coaches and riders will be immersed in the international equestrian discipline of Para-Dressage. Topics include Para-Dressage theory, scales of training, para-dressage test riding, quality of horse, freestyles, preparation for international competition, and much more. Demonstrations will be given from international athletes in each of the five para-dressage grades. Attendees will be given a deeper understanding of requirements and challenges that occur in international competitions such as the Paralympics and World Equestrian Games. Riders and coaches will be given lectures and demonstrations from top Para-Dressage experts including a seminar from international Para-Equestrian Dressage judge and trainer Kjell Myhre. Coaches will participate in collaborative coaching working together to bring out the best in their Para-Dressage athlete. Day One of the Symposium will be formatted as private sessions with Kjell helping riders to improve challenging movements of each grade level FEI test. U.S. Chef d’Equipe Kai Handt will simultaneously offer training feedback to Para-Dressage coaches in order to help prepare high performance athletes for International Level Para-Dressage Competition. Day Two of the symposium will include demonstration rides, test review and more collaborative coaching opportunities. About Kjell Myhre: Kjell has a BA Hons Degree in Business Studies from University of Stirling, Scotland, UK. He started his career working for the City Council of Oslo, Department of Education. In 1998 he was offered a position as consultant for training and education at the Norwegian Equestrian Federation, and from 2000 to 2010 he had the position as Secretary General at the Federation. In 2011 he stepped down as Secretary General, and left the federation. After three years working for a small NGO called Hest og Helse (Horses and Health), Kjell Is now back in the equestrian federation working as development consultant, mainly dealing with the riding clubs and their ability to contribute to the main objectives of the federation – equestrian sport for everyone! Kjell started riding at the age of 12 and has competed nationally up to Intermediate I. He has been a dressage judge since 1990, and became a 4 * FEI judge in 2007. In addition to being a FEI dressage judge, Kjell is a 5* FEI Para-dressage judge, and has judged the last 4 Paralympics. Some of his highlights as a 4* FEI judge have been to judge two World Cup qualifiers, as well as the US Championships for junior and young riders in 2011, and the European Championships for junior and young riders in 2013. Kai Handt was the individual coach for one or more riders at the 2009, 2010, 2011, 2012, and 2014 USEF National Para-Equestrian Dressage Championships earning 2011 USEF National Para-Equestrian Dressage Champion, 2012 USEF National Para-Equestrian Dressage Reserve Champion. He was an individual coach at numerous CPEDI3* from 2009-2014 for multiple riders earning multiple grade championships, overall championships, and as part of the U.S. Team, several Team Championships. Handt was also an individual coach and sponsor at the 2010 World Equestrian Games in Lexington, KY. Served as Chef d’Equipe at 2012 CEPDI3* in Wellington for the Japanese Team, coaching their rider to their first Paralympic Equestrian qualifying score. Served as Chef d’Equipe at 2011 CPEDI3* in Mexico City, flying to the location prior to the competition to select horses for the U.S. Team. Held daily strategy meetings with riders and their coaches, and offered coaching assistance as needed resulting in a U.S. Team Nation’s Cup win, overall individual reserve champion, and individual Grade 1a and Grade Ib champions. Individual coach and sponsor at 2012 Paralympics to the highest placing U.S. equestrian overall at the Paralympics and Olympics. Handt also assisted riders and their coaches with equipment and horse training as requested by the rider and coach at the 2012 Paralympic training camp in Gladstone and in London at the Paralympics. In 2013, Handt became the individual coach for Derrick Perkins, the first Para-Dressage rider from the United States Veteran’s Assistance Program. Handt provided individual training sessions in 2013 with new Para Dressage riders Benjamin Harper, Roxanne Trunnell, and Ashleigh Flores-Simmons at North Texas Equestrian Center. Also in 2013, Handt was the individual coach for Para-Dressage riders Benjamin Harper, Roxanne Trunnell, and Derrick Perkins, as well as selector of appropriate horses for each individual at each show. All individuals achieved top scores ranging from 63.478%-73.478% during that show season. Most Recently, Handt served as USEF Para-Equestrian Dressage Chef d’Equipe at the 2014 World Equestrian Games held in Normandy, France. For more information about the symposium, please contact Laureen Johnson, High Performance Director, Para Equestrian & Vaulting, United States Equestrian Federation, Inc. – Phone: (908) 326-1155 Email: lkjohnson@usef.org. Susan Treabess and Kamiakin. Photos by Lindsay McCall. Winters, CA – November 27, 2013 – The terms camaraderie, team, collaboration, and community were continuously noted throughout the 2013 U.S. National Para-Dressage Training Symposium West Coast. Scheduled November 20-23, 2013, trainers, riders, and auditors had an opportunity to dive into the world of para-equestrian dressage, build upon fundamentals, develop themselves and their horses, and move to the next level. Between the “Train the Trainer” session and the “Rider Symposium” attendees were educated within the classroom and interactive demonstrations. Equestrians rode their own or borrowed first-class horses in individual and collaborative coaching sessions with gold medal para-dressage coach from Great Britain, Clive Milkins, and high-performance U.S. Grand Prix rider Dennis Callin, who is currently competing in Europe. Educational instructors besides Milkins and Callin included David Schmutz, FEI 4* Para-Equestrian Judge and USEF ‘S’ Dressage Judge; Gil Merrick, Former High-Performance Dressage Director; Hope Hand, Paralympian and United States Para-Equestrian Association (USPEA) President; Mike Tomlinson, DVM, MBA, FEI 5* Veterinarian; Tina Wentz, Physical Therapist and Para-Equestrian Classifier; Joann Benjamin, Physical Therapist and Para-Equestrian Classifier; and Lindsay McCall, who is the Public Relations Manager for the USPEA and other equestrian clientele. 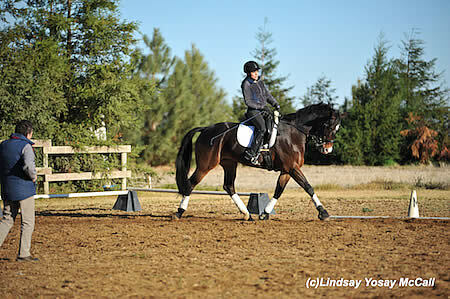 The 2013 Para-Dressage Symposium took place at Somerset Farm in Winters, CA. The four-day event was organized by Carlisle Academy Integrative Equine Therapy & Sports (the education partner of the USPEA) and sponsored by the USPEA and United States Equestrian Federation. Flores-Simmons is aiming to qualify for the 2014 Alltech FEI World Equestrian Games in Normandy, France. Her long-term goal is to represent the U.S.A. at the 2016 Paralympics in Rio. Kaylor headed back to Utah after the symposium where she is studying to be an Occupational Therapist at the University of Utah, while working with her brand new international para-dressage horse. During the four-day event riders enjoyed the collaborative coaching sessions between Dennis and Clive. Clive Milkins also gave the riders and auditors important educational lectures. Those sessions included talking about three main riding techniques: rhythm, straightness, and shoulders. Those three points were emphasized throughout the week. Milkins also discussed his five stages of training which takes a rider from a beginning para-dressage rider to a high-performance international athlete. Lara Oles received rave reviews about her partner American Quarter Horse Slater (AQHA registered name CD Request). Oles is looking forward to continuing her training with Annie Sweet at home in Utah. She is also hoping to qualify for the 2014 World Equestrian Games. The 2013 U.S. Para-Equestrian Dressage Symposium West Coast was hosted by Somerset Farm in Winters, CA. Attributions to “Train the Trainer” included Hanneke Gerritsen 5* ‘O’ Judge 5 * PE technical delegate 3* PE steward. The event was organized by Carlisle Academy Integrative Equine Therapy & Sports and Sponsored by USPEA & USEF. For more information about Para-Dressage, please visit www.USPEA.org. Select riders attended the clinic on behalf of the USPEA and the Carlisle Charitable Foundation. The mission of the Carlisle Charitable Foundation is to raise scholarships for students with disabilities who participate at Carlisle Academy Integrative Equine Therapy & Sports. Additionally, the Foundation supports ongoing research, promotion of medical reimbursement, and professional education in the field of equine-assisted therapy. The Foundation is able to fulfill this mission through donations from individuals, foundations, corporations and the building of its endowment fund. Carlisle Charitable Foundation is a 501(c)(3) non-profit organization incorporated in Maine. All gifts are tax deductible to the full extent of the law. For more information, please visit www.carlislecharitablefoundation.org. Carlisle Academy Integrative Equine Therapy & Sports is a comprehensive organization offering our hallmark equestrian hippotherapy and adaptive programs, new offerings of Para-Equestrian sport, and traditional equestrian training opportunities for educators, practitioners and riders alike. The mission of Carlisle Academy Integrative Equine Therapy and Sports is to transform lives through horses through its distinctive services – rehabilitative through recreational – within an inclusive environment that fosters learning, growth and overall well-being. For more information, please visit www.carlisleacademymaine.com, call 207-985-0374, email info@carlisleacademymaine.com, or check us out on Facebook. Carlisle Academy’s charitable partner, the Carlisle Charitable Foundation, is enabling athlete participation via scholarships. For more information on scholarships, contact Deb Whitney at 207.467.3242, info@carlislecharitablefoundation.org, or visit their website at: http://www.carlislecharitablefoundation.org. Ocala, FL (November 7, 2013) – On November 8th-10th, ten-time US National Four-in-Hand Driving Champion Chester Weber will present at the USEF Young Horse Championship Symposium at the Kentucky Horse Park’s Alltech Arena. As a seasoned four-in-hand combined driver, Chester Weber has spent a lifetime developing horses from youngsters to FEI stars, including his famed horse, Jamaica, who was rescued from a slaughter house before going on to become part of Weber’s international team. “I have been fortunate enough to develop numerous young horses to the FEI level through our regional events in the southeast; however we saw a need to introduce a structured path for breeders and people interested in developing young sport horses,” commented Weber when asked about his involvement in the Young Horse Championship Symposium. Beginning his international career at just 18 years of age, Weber remains the youngest driver to be named to the United States Equestrian Team and to qualify for the World Pairs Driving Championship. During his career, Weber has brought along many young horses through to the Championship level. “I feel that a venue to compete, showcase and develop young horses is needed in the USA. Other successful driving nations have similar programs which has created a windfall for them in developing tomorrow’s stars,” stated Weber. After making four-in-hand driving history by winning his 10th National Championship title, Weber has become the ultimate resource for the development of equine driving in America. At the upcoming 2013 USEF Young Horse Championship Symposium, Weber will speak specifically about the structured development of the young driving horse, the qualification requirements for the 2014 Young Horse Championships, and answer questions for breeders and those interested in developing driving horses. During the November 8th-10th 2013 USEF Young Horse Championship Symposium at the Kentucky Horse Park’s Alltech Arena, USA team coaches and representatives from dressage, eventing, hunter, and jumper disciplines will convene to share their experiences, offer advice, and explain the details of each disciplines’ competition criteria for the 2014 USEF Young Horse Championships. The USEF Young Horse Championship Symposium will offer a panel discussion, in-depth information on the qualifications and requirements for the championshps, and hope to inspire attendees with the updated and innovative competition format. To register for the Symposium and reserve your space, please send an e-mail requesting a seat to: YHSymposiumRegistration@usef.org. View the 2014 USEF Young Horse Championships and Festival Executive Summary here: www.usef.org/images/eblasts/archive/YHC_Summary.html. For the 2013 USEF Young Horse Symposium Preliminary Overview, click here: www.usef.org/images/eblasts/archive/YHC_Overview.html. Follow Team Weber and the official Cosequin Marathon Carriage at www.chesterweber.com and via their link to Facebook. Lexington, Ky. – The USEF Young Horse Championship Symposium is now just days away and anticipation is steadily building for the informative sessions to be held November 8-10, 2013, at the Kentucky Horse Park’s Alltech Arena. U.S. team coaches and their representatives from dressage, driving, eventing, hunter, and jumping will gather to share their excitement about this new program and explain the details of each discipline’s competition criteria for the 2014 USEF Young Horse Championships and Festival. The Symposium will kick off with a reception on Friday evening on the main concourse of the Alltech Arena. Participants and presenters will return Saturday for a panel discussion of the program overview and objectives followed by presentations from each discipline. On Sunday, the Symposium will come to a close with presentations regarding concepts, scoring, and judging. To view the schedule, visit: https://www.usef.org/documents/YoungHorseSymposium/Schedule.pdf. The USEF Young Horse Championship Symposium will inspire attendees as the details surrounding this innovative competition format are revealed. Don’t miss out on an opportunity to witness history in the making and be a part of this exciting initiative designed to specifically identify, showcase, and promote talented young equine athletes. The USEF Young Horse Championship and Festival is intended to showcase and identify the best young horses in the United States in the dressage, driving, eventing, hunter and jumping disciplines. The event is also intended to promote American-bred horses while creating an incentive to buy, own, and show young horses. The Championship and Festival will talent-spot horses in two ways: a competition hosting horses ages four through seven years old, and an in-hand evaluation by a panel of experts for yearlings to three-year-olds. Both will help to provide educational opportunities regarding breeding and development of young horses. Coming soon, on November 8-10, 2013, the Federation will host a USEF Young Horse Championship Symposium at the Kentucky Horse Park’s Alltech Arena. U.S. team coaches and their representatives from dressage, driving, eventing, hunter, and jumping will gather to share their excitement about this new program and explain the details of each discipline’s competition criteria the 2014 USEF Young Horse Championships and Festival. View the 2014 USEF Young Horse Championships and Festival Executive Summary here: https://www.usef.org/images/eblasts/archive/YHC_Summary.html. For the 2013 USEF Young Horse Symposium Preliminary Overview, click here: https://www.usef.org/images/eblasts/archive/YHC_Overview.html.